InterSolar U.S. in San Francisco was one of the largest solar industry conferences in North America to date. As such, it is a useful place to gauge industry sentiment. In Part 1, I talked about government regulations, the U.S. market and the bankability of the industry. In Part 2, I tackle industry marketing. Until late 2008, supply chain shortages were endemic in the solar industry, mostly stemming from limited silicon production capacity. This meant that access to product was more critical than access to new customers – almost everybody could sell everything they had to offer. For a number of reasons – one of which is the credit crunch – the supply shortages have more or less disappeared and we’re now over-capacity in many parts of the solar supply chain. Instead, the current shortages are access to credit and new customers, with a significant new development to report on the marketing side. As the solar industry is slowly becoming more customer-oriented, the industry vocabulary has evolved. Previously, the focus was on cost per installed watt as the key metric. The cost per installed watt isn’t really that relevant for customers, because it doesn’t include the most important factor: the amount of sunshine (or “solar insolation” — the technically correct term) that is available to the system. 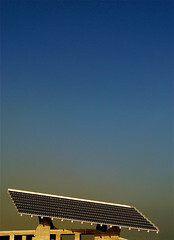 However, InterSolar U.S. demonstrated that the talk now is about LCOE: Levelized Cost of Electricity. This metric is especially important in jurisdictions that rely on net-metering, which is common in many American states. Even in places like Ontario, which doesn’t rely on net-metering, the LCOE metric is important for customers as it allow customers a better metric by which to compare various systems and technologies. As the Ontario Power Authority is finalizing the FIT rules, it is clear that solar technology providers need to undertake a big educational project: to make potential customers understand the meaning of LCOE. It is as important for the customer as understanding the car industry’s MPG metric. That said, the marketing challenges facing the solar industry go way beyond the diffusion of the LCOE metric. With solar markets created simultaneously by both new, more efficient, reliable solar technology on the one hand and new regulations and incentives on the other, the reality is that the solar industry is facing a more complex marketing task than most other high tech industries. Potential customers need to understand both the relevant regulation as well as the technology options available to them before they can make a buying decision. Add to that differences in local weather and climate conditions and solar marketing becomes a fairly complex affair. Much of this marketing challenge must be addressed through product development rather than branding and marcom activities. As an illustration, imagine if buying a car was similar to the process of buying a solar system. It would be like having to buy a chassis, the engine, wheels, brakes, interior, etc. – and then find someone who can put it together for you. And then someone who is willing to finance the thing… Doesn’t quite sound like a mainstream product at this point, does it? On top of that, knowing that the U.S. car industry is in trouble despite having addressed the issues of integration and financing – because they have not been listening to their customers – shows the scale of cultural change that is required in the solar industry to become a mainstream product. In all fairness, there are some indications that this might be changing with companies such as the German companies CentroSolar and SolarWorld offering “IKEA-style” all inclusive packages and Sharp moving towards “plug and play” systems. Others, such as U.S.-based companies Akeena Solar, Renewable Ventures and groSolar, are also moving in that direction which is encouraging from a market development perspective. However, the large majority of companies attending InterSolar U.S. gave few indications that they actually realize the need to be customer oriented, with the potential consequence that the overall market growth will develop more slowly than the underlying economics should indicate – and many of them will not be around much longer.